Why choose helicopter banner advertising? Historically, helicopters have been associated with news coverage and/or police involvement. Because of this, when consumers hear a helicopter flying overhead, their first instinct is to look up. Upon seeing a helicopter advertisement, consumers are immediately engaged. These larger-than-life helicopter aerial banners create buzz and grasp the attention of people on the ground below. How to choose helicopter banner creative? Helicopter aerial advertising is an eye-popping way to get noticed. But, if your target audience isn’t able to read your aerial billboard, than it’s not going to do you or your brand any good. The best advertising banners incorporate a simple message with a strong call-to-action (CTA). Check out some of the greatest aerial ads in Van Wagner Aerial Media’s Hall Of Fame. Remember, the quality and material of the banner you decide to use will also make an impact on legibility. Cheap advertising banners will not last as long and aren’t as clearly visible from the ground. 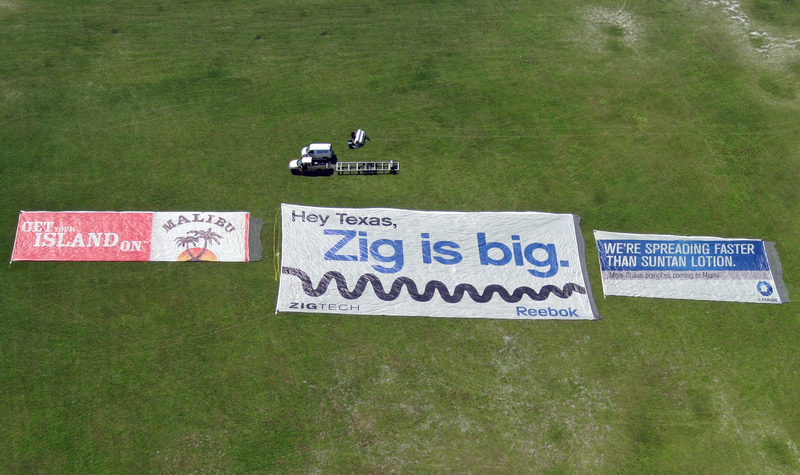 Look at your aerial banner as an investment, capable of flying 40, 50, even 100 flights. Helicopter banner towing is just one possibility when it comes to your sky campaign. You can also choose aerial banners towed from a fixed-wing banner towing planes, advertising blimps, hot air balloons, and/or sky writing. Van Wagner Aerial Media can help you determine which type of media is right for your campaign. Click the button below for a free aerial assessment.